Have you ever noticed that whenever Indian cuisine is mentioned anywhere in the world especially about the South Indian style the word "Chettinad" pops up immediately. Coming to think of it is one of the most popular styles of cooking both in my home state [Tamil Nadu] and else where in India and outside. It is known for its spicy preparations both veg and non-veg, array of ingredients that are added both ground and whole, various breakfast items from kuzhi paniyarams to appams and elaborate cooking methods. 1.Rich in dietary fiber which helps remove "bad" cholesterol and ease bowel movements. 3.Rich in iron, potassium, calcium and zinc. 4.Wonderful source of essential vitamins like A,C and thiamine. We all know that tamarind is an excellent preservative which helps keep dishes edible for a long time especially in hot climate as in South India. Come on , think about it. All the ingredients : pearl onions, garlic, ginger, pepper corns, cumin, fenugreek seeds, asafoetida, tamarind and coriander seeds are all bursting with good fiber, good cholesterol and blood cleansing properties. After all "Food is Medicine" and I think our great grandparents and their great grand parents have understood this concept fully and this has what prompted them to include such wonderful ingredients in our daily menu. This is my favourite dish as it is spicy with a hint of sweetness from the onions in a sour tamarind base with pungent pearly garlic hitting the spot when I need the comfort of home cooked food. This curry develops and deepens in flavour when prepared in a earthen ware pot [manchatti] and eaten the next day. It is important to cook this kuzhambhu with gingelly oil [Nallaennai] ..
Asafoetida powder [hing]: 1/2 tsp. Slice the onions and garlic to thin slices. Roast the spices, first from the cumin to the curry leaves and then add the onions and garlic until golden brown in colour. Cool and grind to a paste. Keep aside. 1.Soak the tamarind in the warm water for 15 minutes. Mix well with your fingers until it becomes all mushy. Strain and reserve the tamarind liquid. Discard the bits and bobs. 2.Heat oil on medium flame and add the mustard. Let it splutter. 3.Add the fenugreek and curry leaves and let it brown. 4.Add the red chilli, whole onions and garlic pods. Saute until the garlic pods are slightly cooked. This will take around 5 minutes. 5Add the ground paste along with 1/2 cup of water. 6.Mix well and cook in a low flame until oil floats on top which will take around 6-8 minutes. If the masala becomes too thick add a bit of water. 7. Add the tamarind liquid into the bubbling masala. Mix well and cover with a lid. 8.Simmer for 10-15 minutes in medium flame until the raw smell of the tamarind is replaced with the pleasant aroma of the curry. 9.Open the lid and mix well. 10.Sprinkle asafoetida powder and salt. Give one last stir. 11.Remove from flame and garnish with coriander leaves. Serve with hot rice and fried pappad. Note: Feel free to use coriander and cumin powder if the whole seeds are unavailable. Do not roast the powders. Just add the powders directly after step 4 in the recipe followed by the ground paste and cook as above. If you are very health conscious then omit the fried pappad. Keep the oil addition to 1-2 tsp as given in the recipe and cook in a non stick pan. If not so health conscious like me, then eat this curry with lovely fried pappad. Don't forget to drizzle a tsp of gingelly oil on top of the curry when eating. Simply yummy. I love chettinad recipes very much. Wonderful. 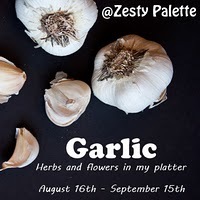 I love garlic and i have never come across this recipe. love chettinad cuisine for its fiery taste and wonderful use of spices! Delicious and healthy recipe,looks so yummy. Such a tangy and yummy dish.. Looks awesome. never knew of this curry. it looks lip smacking. When I just see the pic, thought of grabbing and eat. :-) A mouth watering garlic gravy with steamed rice. I never say no for meal if it is given. Love those pearl onions and the garlic in the kuzhambu Reva. Nice clicks. Mouthwatering clicks.. nice to learn chettinad style.. I normally prepare pulikuzambu in a similar way but without the paste..
Poondu Kuzhambu with hot rice n fryums wat a yummy combination..this is def must try kuzhambu..too good esp the paste which is added..
Freshly ground Chettinad spices are always special, poondu kulambu looks very tempting and nice clicks. looks perfect and very tempting dear. Puli kuzhambu and vathal! my kind of comfort food..
Beautiful clicks dear!!! looks so delicious ..i m sure it tastes heaven with rice.. Exactly this is the way we make except will not grind onion in the paste.. my very fav menu.. simply drooling seeing ur gorgeous pictures Reva. Splurt, very flavorful and tempting recipe, bookmarked it. wow....so spicy n flavorful Kuzhambu..love the chettinad version ..never tried this way..too tempting clicks Reva !! omg,this really amazing recipe...wonderful combo with vadavam...Clicks are very tempting. hi reva, first time i have ever seen such a tamarind garlic dish. Never thought you can make curry out of garlic...woww. Poondu kulambu is my favourite too. Loved your read up about the medicinal values stressing the point 'Unave marundhu'. Omg, makes me hungry,just craving for some..
Reya, I'm certainly trying this recipe at home! I'm a gujju and trust me nobody in my house has ever tsted a Chettinad... It's time we did so! Thank you so much for stopping by my blog.Your blog is Awesome,Amazing pictures,kuzhambhu looks yummy and tempting. I too love chettinad cuisine but am only familiar with the chettinad chicken...so thanks for sharing a diff dish of this cuisine. My hubby loves this small onions in smabar... I should give a try with this recipe. Thanks for sharing to my event.